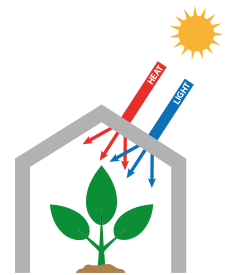 Optifuse® is a removable greenhouse paint which diffuses incoming light while maintaining valuable grow-light levels. Optifuse is very wear resistant and specially developed for application on the outside of glass greenhouse surfaces and is removed with Topclear. 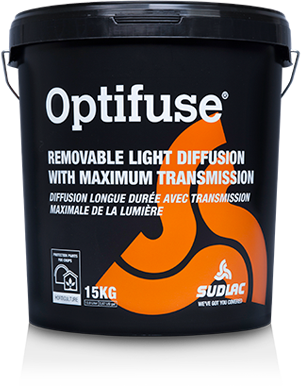 The Optifuse coating offers a very high level of diffusion and almost no light loss. The incoming light is scattered by the diffuse coating layer, reaching the leaves from all sides from top to bottom of the crop. This will improve the photosynthesis and transpiration of all plant leaves, resulting in a better humidity, temperature and CO2 level inside the greenhouse. It is proven by research that diffuse light has a positive effect on production, quality and growth of your crop. Optifuse is advised in the areas with a moderate temperature. For warmer areas we advise to use Optifuse IR. Optifuse needs to be diluted with water before spraying it onto the greenhouse. Depending on the type of greenhouse and climate, more or less water and buckets should be used to achieve the best result. Optifuse needs to be applied by machine to get an even layer for optimum diffusion. Optifuse can only be used on glasshouses where a brushing machine is available for cleaning. Optifuse is removable with Topclear at every desired moment. Apply Topclear in the advised amount and dilution maximum 3 days before rainfall. Read the complete instructions on how to use Topclear. Try our online product advice tool to get a personal advice. Get detailed information on usage, dosage and mixing.